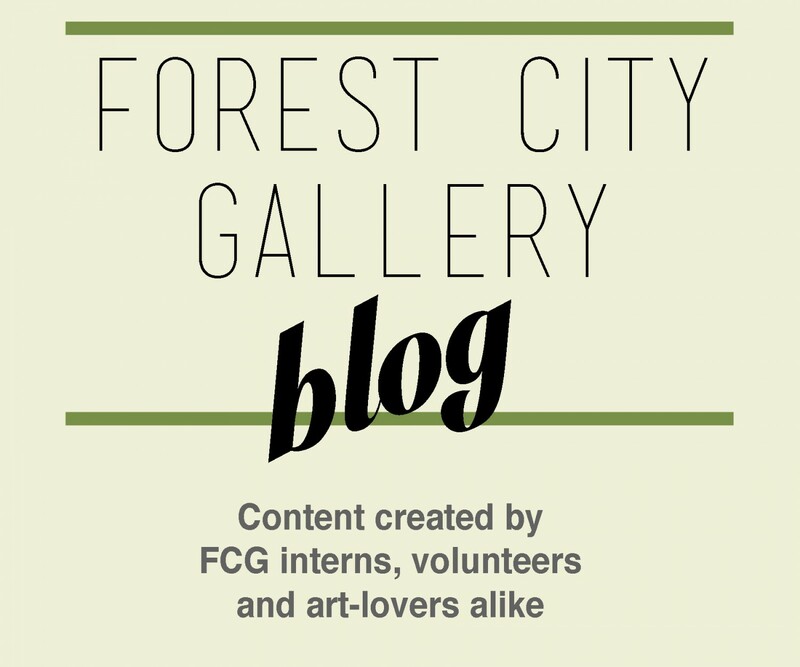 On her last day in gallery, Forest City Gallery’s 2013-2014 Intern, Emily Simpson wrote a responsive article regarding the exhibition Extra Ordinary. This exhibition was curated by FCG’s current Director Jenna Faye Powell, and features three emerging artists Matt King, Sam Mogelonsky and Bree Zorel. Emily elaborates on some of the shared aesthetics, themes and concepts that run throughout the exhibition. Forest City Gallery’s show Extra Ordinary is a refreshingly accessible exhibition. Featuring the works of Matt King, Sam Mogelonsky and Bree Zorel, the gallery space tends to its viewers offering different instances of reinterpreted familiarity. Though striking visual temptations activate initial viewer interest, deeper meanings of the works speak to violence and mass production, social storytelling and the peculiarities of life. Curator Jenna Faye Powell states, “The artists chosen for this exhibition have crafted objects that may seem too ubiquitous, too shiny, or too humourous to hold any other agenda than to entice and tempt” (Jenna Faye Powell, Extra Ordinary, 2014). 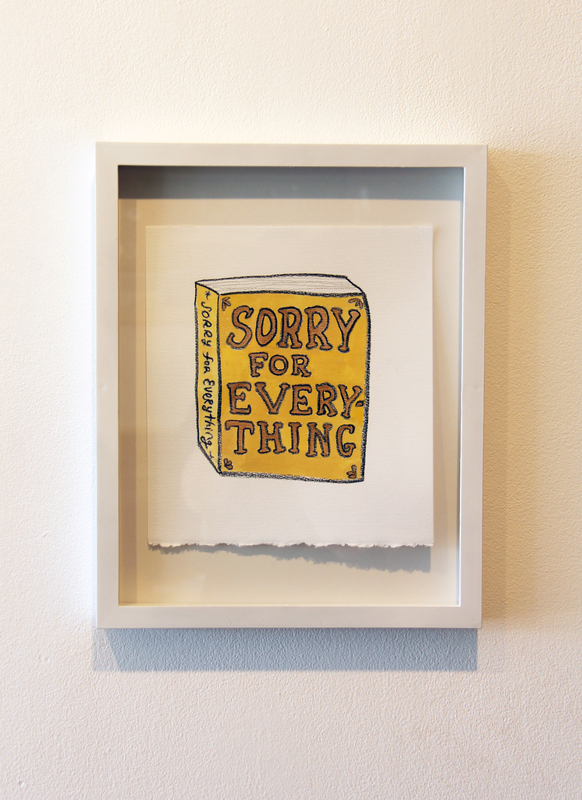 Extra Ordinary is curated by Forest City Gallery’s director Jenna Faye Powell. This opportunity is given to the person in her position every two years and for Powell, this will be her first solo-curated exhibition. Bringing three artists together in a similar spacewhile maintaining flow and thematic clarity is no easy feat, but Extra Ordinary accomplishes just that due to the conscious, careful decisions made by Powell during the past two years of its process. The space of the gallery mimics the contemporary and minimal features of the unremarkable objects. Preconceived expectations of a common art gallery accurately describe the space for this exhibition, however because everything is curated to expose that which lies beyond the usual, the space itself becomes of greater importance. The stark white walls are under-covered, therefore greater exposing their mere purpose and existence. 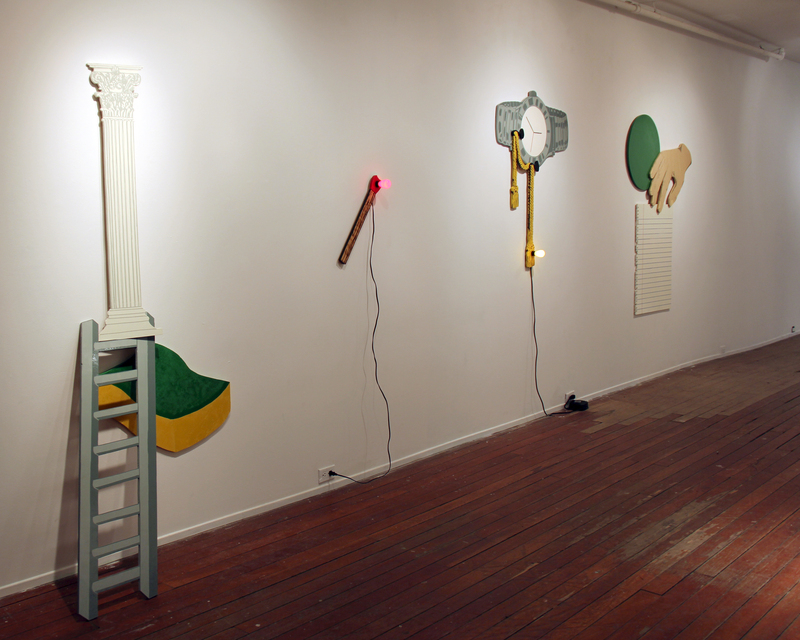 The walls appear on display, as do the objects presented on them. In this sense, the exhibition presents as awaiting viewer inspection and interpretation. 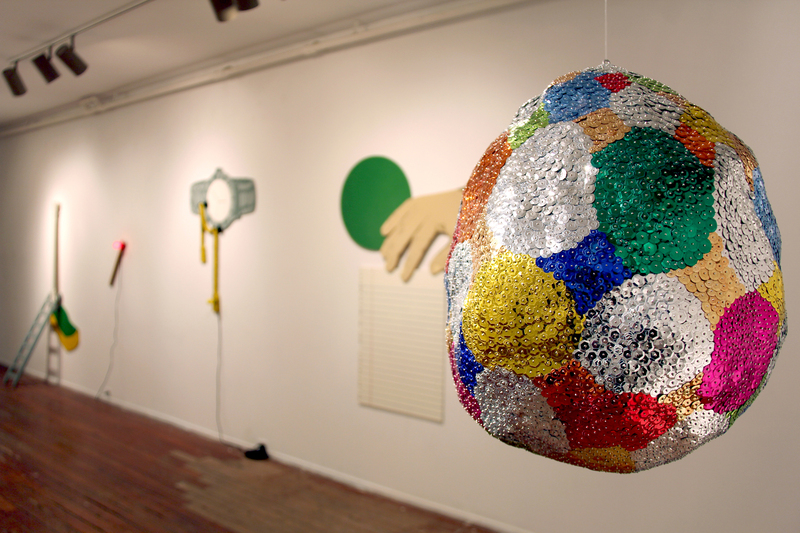 Each artist uses different tactics to transform ordinary objects. Sam Mogelonsky’s works showcase the artistic process involved in their making – a form of fascinating seduction that comes across as assertive in nature. The objects do not offer anything other than their basic form and creation and yet it is hard to look elsewhere. Mogelonsky’s shiny objects recall ideals of mass production. Her works visually reference children’s art projects that are professionally done. Highlighting the mechanics of the human ability, these works speak to the self-destructive, cyclical nature of mass production. Matt King’s works exist in the social world referencing jokes and stories whose familiarity instigates conversation amongst viewers. Some stories are known and generate relatable conversation while others may not present as recognizable and therefore ask viewers to interpret outside of what is physically presented. Referencing common modes of advertising with glossy enamel signs and bright colours, King’s works function in the gallery space as familiar objects whose existence we now contemplate because their marketing function has been removed. Relating the sign back to its referential starting point is no longer appropriate and therefore the viewer internalizes their thoughts and reflects on their position in relation to the artwork. 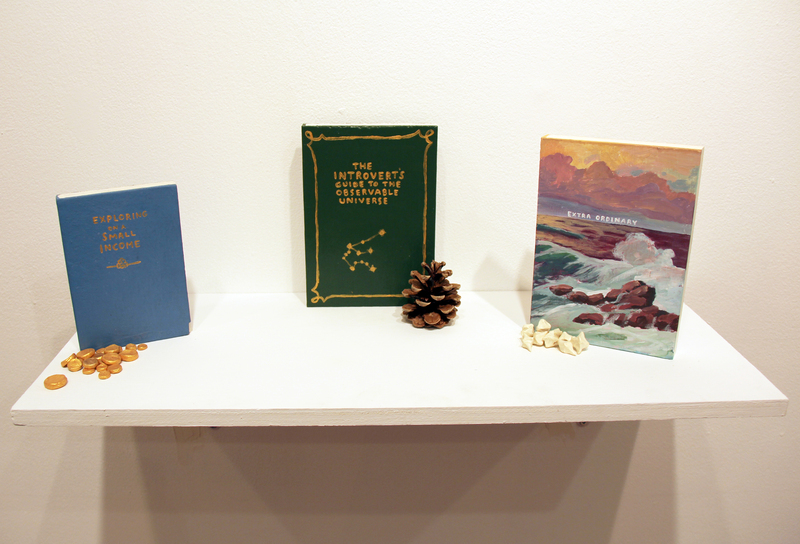 Bree Zorel plays with the slowly fading notion of printed novels. With technology today and the rising popularity of online texts, the printed novel is romanticized. Zorel’s endearing book cover drawings reference the online idea of a book purchase, not allowing the viewer to see the contents of the book, only the exterior. Zorel’s works capture the viewer eye with lovable imagery and utilize a form of honest intimacy that questions the industrial world today. Her sculptural works again play with the sentimental value of a printed book and simultaneously move away from the profit-driven norms used with contemporary print publications. As a collective, these artists are able to showcase how so much of everyday life can be overlooked and under-analyzed. Extra Ordinary reminds us to look at the things that we routinely encounter and contemplate the actions we habituate. In a time where everything seems to be moving in such a quick, automated fashion we must utilize our minds and our ability to form opinions. Extra Ordinary hands creativity back to the viewer allowing for an undeterminable amount of uncalculated responses and thus brings us back into the awareness of our own world, mind, body and abilities.